School Crossing Guard Recognition Program Crossing guards are out every day regardless of the weather with little recognition. This is why we've started the School Crossing Guard Recognition Program. 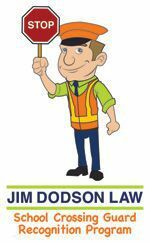 Crossing guards help children safely cross streets every day. They protect kids from any harm in all types of traffic situations throughout the year and in every kind of weather condition - pouring rain, cold winds and sweltering heat. Do you know a crossing guard who has gone the extra mile in his or her line of duty? Someone who brightens the day with a friendly smile or an encouraging word? Clearwater safety advocate Jim Dodson would like to say a special thanks to these unsung heroes in our community through our new School Crossing Guard Recognition Program. Here's what students, parents, grandparents or caregivers can do to help.